The last walking stretch to the ancient Tharpaling Monastery is along a rural road up and down switchbacks, past meadows of wild flowers and pristine pine and oak forests, and past rustic farm cottages. Tharpaling, a 13th century sacred pilgrimage site meaning “Place of Awakening,” was our morning destination. Walking quite a few kilometers, we came around the bend and came across a farm family of three generations. 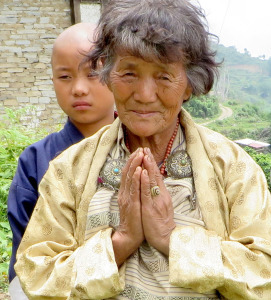 Grandmother was wearing a full Kira outfit of elegant embossed brocade woven silk, with compassionate eyes and welcoming gratitude, for our making the pilgrimage. Looking at her hands and into her eyes, I wondered what she has done with her hands and has seen, in seventy years. No doubt she might not have traveled much beyond these three sacred valleys that are occupied by farmers, monks, deities, yaks, golden and grey monkeys, and grandchildren. Embedded under her fingernails is the soil that nurtures the fabled red rice, exuberant asparagus, astonishing plums, and spacious, sweet corn. Over the days, watching women bent over paddy rice fields, we will never look at a grain of rice, quite the same again. From now on, we will celebrate and honor each grain of rice we eat with gratitude … for now we know the dedication that goes into the gift of rice. I was thinking about this culture, this place in our heart called Bhutan, with its deep wisdom, that is only now, after many centuries, opening up to the West, and I wish to share the following Bhutanese folktale, reflective of the deep well of Buddhism, that everything is both connected, hopeful, and also impermanent, which resonates throughout this precious Kingdom. Artemisia plants have grown over it.